How Do I Install Your Bifolding Doors? 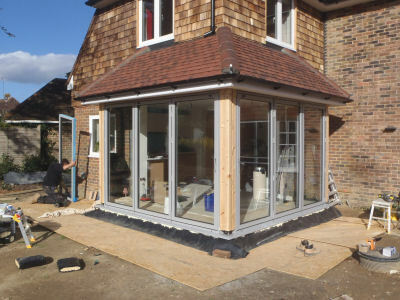 Fitting folding sliding doors is not difficult, however when fitting them you need to take due care and attention in order to fit them flush, square and level. They require more precision, knowledge and experience than fitting other aluminium window and door systems. This is not to mean that you can not do it yourself. All of our doors are supplied with an assembly and installation manual, which is simple to understand and yet provides all the detail you should need. If you have experience in fitting conventional window and door systems and the knowledge to do this correctly and efficiently then you can fit folding sliding doors. The essential thing to remember when fitting Bifold doors is that the cill, threshold, head and jambs must be fitted dead level and square, otherwise the Bifolding doors will not operate correctly. The frame cannot be bowed or pulled out of shape by the fixings or unsupported weight from above the doors. The doors must be correctly glazed and Toe and Heeled correctly in the positions shown in our our manuals, in order to ensure correct operation of the doors (see PDF downloads above). The correct Toe and Heel procedure must be undertaken to ensure perfect and sustained operation of your doors. The packers support the weight of the door when folded, preventing the frames from dropping. While the bogie wheel assemblies are more than capable of taking the weight, if the weight is hanging out of the frame then the weight is not fully supported by the bogie wheels. All doors come with an installation manual and you can download it from this page now from our website (see PDF download’s above). This way you can take a look and see what's involved before your doors turn up. If when your doors turn up, you still have any questions about your bifolds that have not been answered by our installation manuals or our website, then please call us and ask one of our advisors. We have 10 lines and we are always happy to answer your questions. You can also visit the GGF website for fitting advice. We have found that many trade companies do not want the fuss and hassle associated with fitting bi-folding doors nor do they want to go back to site when it’s not quite right. This is why we have introduced what we refer to as our fixing service. Designed specifically to help out builders or trade customers and prevent site visits later on when the doors have dropped. We will come out onto site and fix your doors into an existing and fully prepared aperture, leaving them in a fully working condition with nothing left to do, but make good. We can also provide onsite tuition, training and advice on how to fit our folding doors so that you can give your fitting teams the opportunity to fit our bi-folding doors more confidently on future jobs.